your patterns are really great. i'm trying one of yours now for my daughter's wedding. Worsted weight yarn, I used Red Heart Super Saver. I don't know how much, a very small amount. Great pattern, thanks for posting it. I whipped one up in no time which made me very happy because I am new to crochet. Thanks so much! This is exactly what I needed to take on vacation! I put it together in an evening - now I'll make a few more! ...absolutely love this lil case. I was looking for something exactly like this in a store and was unable to find it.This is even better because I made it myself and it was less expensive than anything I could have purchased. This is gonna be one of my gifts to give for Christmas. Thank you so much for making this up for us to use. I am in the process of downsizing my purse, and this is a wonderful idea. Please keep them coming!! Made this for my son, and he just loves it, small enough to keep in his pocket, and room for some cash and school id. Thanks for the pattern!! umm... when i was trying this pattern, i noticed that it tells you to chain 15, but only sc in 13. i feel bad correcting something if it's whatwas supposed to be there. Looks like you are an inexperienced crocheter. I copied Round 1 below and between the * * counted the chains. Hope that helps you. I made this little case today while driving to Jeddah (2hour trip) in Saudi Arabia. I used cotton yarn to match the Nook bag that I made with pockets. This was exactly what I wanted to go in it! Something small and practical for carrying just that little bit of necessary money and cards when I take my Nook with me. It will be very handy on the plane in August when I fly home to the States. Thanks! 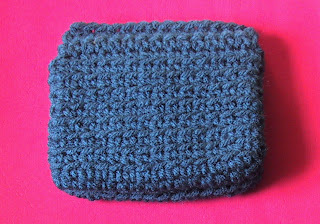 I am an experienced crocheter, so I had no trouble finishing the case off, but might I suggest, for the less experienced you put finishing directions? Thanks again for a great little pattern! I'm going to make more of these for gifts! Oh, BTW, I used a multicolor cotton yarn (Lily Sugar N' Cream) and it tended to come up short also, so I did the 17 ch. what does 'do not join rounds' mean? I am a beginner and I am missing something... how do i keep from having one long round that goes and goes, and twists the pocket. thanks! It means don't slip stitch into the first stitch of a round. Just move your marker and keep going around. I use a bobby pin to mark rounds. Start with a longer chain. 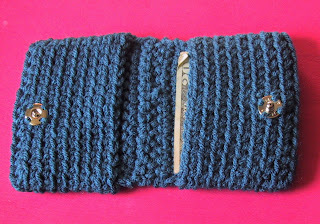 I actually made one to fit my checkbook. I will look to see what I did and post those instructions. First you make the pockets, then the rows are the hinge. I am confused about the fold? There is really a fold. Just two haves joined together. Fold the instructions and it should make sense as you go along. I'm new crocheting and don't understand in the first row what you mean by work in opposite side of starting chain? When you work into the chain there is one loop left free, that's "opposite" side of the starting chain.